Mod: Although folks with a personal stake in some of the other items on this evening's City Council agenda might disagree, and those with their own axes to grind often do, there really is only one item on the bill that very many people are going to care about. And judging by the amount of time set aside to discuss this one, City Hall is expecting something of a turnout. There could be a bit of real excitement. Resident Deb Sheridan widely circulated an e-mail to the City Council on this topic yesterday, and before I get to what I wanted to post about today I thought I'd share her observations with you here. As you discuss our ongoing water problem, restrictions and future penalties tomorrow evening, I hope you will solve how to administer them more fairly. As has been pointed out by the Simpsons, Allens, and others, those of us who have been conserving seem to get hit the hardest. Every time we've been asked to conserve, I have cut back more of my water usage. Now I've got the smallest amount allowable (12) for a 2500 sq ft house on 3/4 acre. I have no lawn left, and my trees are dying. Many people I've talked to are allowed much more than I am. My friend on Auburn also has an allowable amount of 12. Her next door neighbor, in a nearly identical house, same yard, but living alone has an allotment of 25. How can this possibly be? If you are going to seriously impose restrictions, why can't you use some quantifiable measurement - number of people living in the house, plus square footage of the property? Karen Schnaider or Elaine Aguilar, stated that this wouldn't be possible. Why not? If you think it would take up too much staff time, then ask for volunteers. A huge advantage of living in Sierra Madre is that we have such a diverse population of educated people who are willing to volunteer their time and expertise. Needless to say, and as I'm sure you got this from reading Deb's e-mail, water conservation enforcement in Sierra Madre is not quite ready for prime time. And as you can imagine, any show of unfairness by the city over the enforcement of water penalties, which could now also involve far greater amounts of money, is not going to be very popular. There is another the part to what the public is talking about now. That is in regards to the 70 families who applied for revisions to their water use numbers, some last year and then again in September because Director Karin Schnaider left and the process had fallen apart, and they have still not had their applications addressed. They are now being asked to again reduce numbers that they already cut to the bare minimum. Which means the most attentive and caring of Sierra Madre residents, the ones that actually listened to the city, could now face some of the worst of the new water use penalties, based on indifferently applied simple math. So do residents have the same rights as developers regarding applications? Those 70 families should not have to have to endure any home inspections, either. They should be allowed the exact same reviews and exemptions under the rules that were in place at the time they submitted their applications. You could come away from all of this with the impression that the first and foremost consideration for City Hall is the amounts of money they will be able to rake in. With everything else a very distant second. But I digress. Here is what I meant to say today. 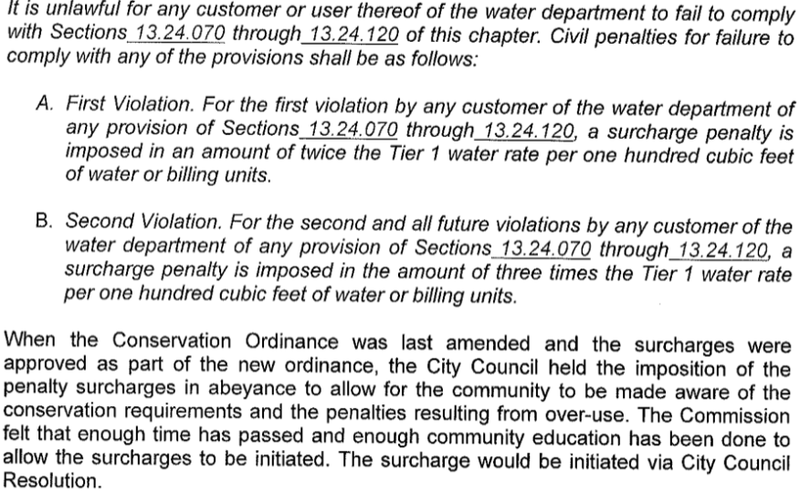 Fines for using more water than deemed appropriate were suspended by the City Council a few months back. The penalties had been established, but never activated. They just kind of hung out. However, the CC also tasked the Energy, Environment and Natural Resources Commission (or EENRC, an awful acronymic that Nancy Walsh stole from the equally awful COG), to deliberate upon the punitory aspects of all this, and then return with some informed recommendations to the Council. This Commission seem to have gotten a little carried away. It looks like the EENERs want to crack you upside the head a lot harder than even the City Council dared suggest when all of this first came down. With penalties that are exponentially higher than before, and the gendarmes pounding on your door. The EENERs also want to start doing this right now. As you may know, my feelings for the EENER Commission have never been warm. My take has always been that when then Mayor John Buchanan first cooked this fritter up in the form of the Green Committee, his intentions were less than pure. The unstated purpose being if you want to impose something on the townies that is not very popular, you get a Green Committee style resident body to make the more unpleasant recommendations first. Then, when whatever that unhappy decision was does get brought up at a City Council meeting, all the elected will have the luxury of saying it was done at the request of EENERs. Which conveniently gives a Mayor or Councilmembers the ability to deny that "this difficult decision" was originally their idea. Especially when it was. So anyway, the EENERs have made their decision, and apparently are very upset with you over your biological dependence on water. And should their recommendations go through tonight, you could get the holy hopping bejeezus fined out of you for not substantially curbing your usage. There you go. Instead of the original 2 to 3 times penalty rate, you could now be dunned as much as 10 times the original rate instead. 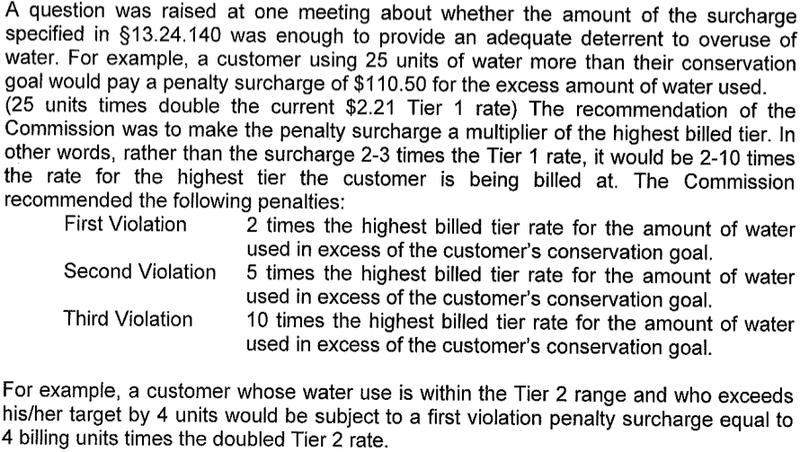 And it is not like this is a water rate increase requiring a Prop 218 "process" or anything, right? Do you know that? Good, then will you please tell me why it isn't? Because that is exactly what it looks like to me. So what if you decide to appeal all of this crazy stuff? Or fight back, as it were. Then you'd better have your "water audit done by water conservation-certified staff" in place first. There's an intrusive government visit you could probably live without. Of course, if you do want to let those folks into your home, then I guess that's your business. But remember, they're looking for things that they can charge you money for, like code violations. Permits are a big earner for City Hall. Like I said, if you are a Mayor or City Council person who wants to get some unpopular pieces of legislation in place, especially ones that involves the taking of even more money, it is best to first find residents who will make those recommendations for you. And that is where commissioners like EENERs come in. Though, to be completely fair, this one might not have been their idea alone. I've heard some talk to the contrary. It would be great to hear a little discussion about that as well tonight. Sounds like the eeners could be all wet. It's not the EENERS who gave themselves this "task" - it's the council. Well, I guess that means they're all in the hot tub together. They're wringing the last possible drop out of the water company. So, who is on this commission? Does the city manager sit in their meetigs? There are many people in town who have not bothered to cutback. I see them watering on off days, etc. Perhaps they should pay a price for not conforming. And if there was some influence on this commission, who would that be? So much of city hall is clouded in mystery and double speak. It has never made sense to me that the amount of building is being allowed, new houses with so many bathrooms, and we have no water. Again, the benefit of this roll in of cash are the high priced staff. The City Council needs to address that. They haven't and they won't. Again, it's up to us. Maybe this issue will hit people in the pocket so they'll go to a meeting. I will be very surprised if there are many people at this meeting. If they can afford a 5 bathroom house, a water fine is only money. That grows on trees right? Or better yet, it belongs to the people who work and don't live here. Will anyone notice if I take fewer showers? Perhaps someone smarter than most could devise a water use deterent other than charging mo' $$, but it ain't happened yet. One way (but things would have to get much worse first, and this isn't beyond the realm of possibility) would be water allotments; you only GET so much based on some criteria, and thats it. So, if you want to water your tropical garden and flush the toilet when you drop a dead fly in it, go ahead, but you may end up real thirsty before the end of the month. THere is no way any small town politician can appropriately get their head around what this global climate change influence is on Sierra Madre and appropriately direct acceptable policies that would work for all. Lets face it - water has been cheap for all of our lives until now and change is painful, in various ways. If Sierra Madre had some ocean front, we could build a tiny de-sal plant, but that aint gonna happen. So, if our wells don't product anymore, we are reliant on others, period. We are bubbling our way toward a solution but again, it's not a pretty path. Maybe they WILL only give Sierra Madre so much water! Check out today's Pasadena Star News article online; “Southland consumers have responded to the water conservation challenge this past year. We all, however, need to be prepared to take water saving to another level this summer if water-supply conditions don’t improve,” said MWD General Manager Jeffrey Kightlinger in a statement. Cutbacks could amount to 5 percent, 10 percent or more from last year’s deliveries, Metropolitan reported. “They’re saying, ‘This is all the water we will give you,’ ” said Adan Ortega, a former MWD administrator and a water consultant for smaller water districts. An allocation plan is different than simply meeting the water demands of its member agencies, as MWD normally does, he said. The new approach could trigger more restrictive conservation measures for customers of retail water districts and cities throughout Southern California. Quick! Build more 5 bathroom McMansions! Yeah, but the way the city has this set those who paid no attention to water conservation in the past have all the advantages now. The city makes its own problems. After having enabled the kind of lot splitting big house building mania we can see all over town today, the city's call for draconian water fines and house to house searches is just a bit hypocritical, don't you think? Let's see, the city makes a lot of money from permits and Development Impact Fees for new construction, and it also will make a lot of money fining the tar out of the residents over water use. All in a day's work! the EENER Commission is like that group of sixth grade safety patrol kids you knew in school. give them a bit of responsibility and they become self righteous bg power authorities. Reminds me of that famous psychology test about obeying orders. The one where subjects were given orders to administer electric shocks to actual people. Some push the shock button, some don't. The EENERS pushed it. At some recent meeting (they tend to blur into one big blob of political mush), Inman said that the city had sent out 500 violation letters - 500 water customers who violate conservation in a big way. Well they're making it tough for everyone else. Why aren't just those 500 residents targeted? Give me a break. Ag water is 80% of the state's consumption, industrial is 10% and urban areas get 10%. It's just a squeeze play for dollars. The water situation shows the inept and sinister aspect of our City Manager Aguilar. 1.The "Proposed Amendments to SMMC 13.24 allow The Water Dept., to enter your home to "evaluate indoor and out-doorwater use and prepare an audit document". "Each Audit would take an hour and a half". Wake up Sierra Madre -they are making it law to snoop inside your home for an hour+ on the pretext of water conservation ! And if you refuse ,you get no help with the meager water ration. This is coercion for unreasonable search and seizure. 2. The EENR 'recommendations' simply require you cut back around 30%. So if you have previously wasted water it will be easy to meet the target. If you have been economical with water ,or you live alone you will find 30% very difficult to achieve. If you have had a change in circumstance it will be impossible. The obvious solution is a water allowance per person per household. That was too simple so the wasted more of our taxes on foolish consultant nonsense. Aguilar at her typical best - devious, inept and abusing the Public Trust, squandering our taxes and achieving nothing but discord, distrust and chaos. We do not need this stupid regulation, we need a competent ,honest City manager. I vote for a major upgrade Neal(rip) ! The snooping is to also look for building code violations. Penalties for code violations = $$$. That picture of the guy peeking over somebody's fence gives me the creeps. Another one of the Mod's treasures. That picture says everything. It's called Illegal Search. Not that it won't happen with the proposed ordinance, though. Did anyone remind the Water Dept to operate the "sluice gate" on the Wash when it rained? Note I didn't say did we ask them. Why? Because you can't get a straight answer from the Water Dept.! OT: Anybody know why the mail boxes were removed from the Howies parking lot? Give people a reason to go into the Post Office? Don't kid yourself. The Postal Service is probably planning on closing the Sierra Madre Post Office. The closing of the Sierra Madre Post Office has been in the works for about two years now. Post Office clerks confirmed last year that our station was on the list for closure. Of course, the post office has done several stupid things lately including moving the drive-up boxes at the Arcadia post office so you have to get out of your car to use them. The Council is between a rock and a hard place in trying to come up with a plan that would satisfy the conditions of the moratorium and what would be fair to the consumer. I'm sure the Council would welcome anyone who could come up with a good plan. Debbie's idea of number of residents and size of lots makes sense, but there are so many variables. Let's say there are two of us on a 50X100 foot lot. I change my landscaping for no lawn, drought resistant plants, however my son moves in with his family. More laundry, more dishes, more everything related to using water. How do I compensate? The city could say I need to come down and apply for a change, but that would mean they may have to change their allotments several times as e.g. the family leaves, or more come, or? What to do. You need to look at this realistically. It is more about the money than the water. And the people who are going to get hurt the most are our financially vulnerable residents. Wonder why Rep. Judy Chu isn't working to save our Post Office? I thought she cared. Where is George Orwell when we need him? Judy Chu cares, but she cares even more about the people who will buy the land the Post Office stands on. Back to the post office - many of us used those boxes frequently. They were much more convenient than parking and going inside. Good way to keep the office itself less hectic. So what to do when something is very successful? Eliminate it. And have you ever been in our post office when it wasn't busy? Again, I guess because it is a good and thriving business, it needs to be eliminated. It was a big mistake to institute the EENR whatever in the first place. But since it's there, I hope it will continue to protect the trees, and other than that - how about if they are watchdogs for how water revenue is spent? 12:45 ~ I agree. Always liked using the drive through. My first thought was that the city is selling the lot, and the developers are warming up their tractors. That whole corner is Texas Tea to them. Bastards!!!! Both sides of that stretch of Baldwin might be up for sale. How many lot splits could you get out of the Post Office property. Three? Would it be a lot split or a multiple housing development? It maybe in the professional zone. Something else seems to be in the wind as the once open parking lot behind Howies got cordoned off so you could not enter from the east and drive through to park on the west side at the back door, or "cut through" to the mail boxes. what is the story on the lot south of the post office, been empty for at least the 50 years I have lived here. This EENER proposal reads like a developer's dream. Force all the fixed income older residents out of town, buy up their property and go to town! I could be wrong, but I have this rambling thought. It seemed once upon a time citizens volunteered for many things in around a city. Then it seems laws were made that these volunteers had to be monitored by city staff. Many commissions became puppets to the wants of the city and had no real power to change anything. We can't have regular citizens do the research about historical houses, we have to pay for someone to do it. The amount of government that has become a part of our lives is appalling. Yet these city, county and state workers are citizens like we are. They pay taxes right? They get better salaries and perks than we do. They salaries and hiring and firing are protected by unions. We elect the politicians, most of them in turn back the unions. It has become a system of them against us. In yesterdays Tattler I read a reply to a remark that had been taken down by the moderator. I can only assume that it was about the guys who hang in the park to get work. The person was told that these guys were looking for work or just relaxing the mark and to mind their own business. Okay. I get that. The problem is these guys get paid a day rate. No taxes. It benefits them and the person who hires them. I have a wonderful gardener. He only employees himself, work hard, became a citizen. He has to pay 500.00 a year for the joy of doing his job. The guy in the park doesn't. This probably won't be published as it will cause controversy. But I think it needs to be said. What might be good for some is not good for others. We are in this huge mess with taxes because those elected officials feel it's okay to give our money to whomever they choose. It only goes so far folks. We can only support so much. Those who feel any person who has an opinion contrary to theirs is the root of the problem. So here we are tonight waiting to see if we will be taxed more. Will it go toward water infrastructure or salaries? Will it go toward a home for the homeless on Montecito or will it benefit the citizens of this city. Your choice. Good post. But the reason that comment came down is the poster was talking about something rather personal to himself. He should probably place a small ad in the back pages of the Pasadena Weekly for that kind of interest. Multiply the guys in the park times 1,000,000+ and you can get an idea about Amnesty. Most of the "undocumented" folks aren't paying taxes. Same ol', same ol'. The rest of us have to pay. Duh. How do you know the guy in the park isn't a citizen? 2:30 - check their driver's license. There's always the swap meet. I never said they were illegal. I said they don't pay taxes. I figured that out cuz I just think the guy who hires him pays under the amount required for him to do a 1099. 3:41 P All you can do is laugh? Words escape you? There are also the tears. At least your face will get clean from all that hard work. Mayor Harabedian is proud that Fran DeLach is going to be running the COG now. Fran was the dude that pumped all that taxpayer cash into the pockets of Nick Conway after he had been shown the door. The Water Boy is speaking. Does anyone believe him after all this time? What does he do all day at his desk. Count drops, drive around and figure out which person has greener grass. How about Bruce Inman's culpability in running our water department into the ground? How about a qualified Water Department manager who would have shown previous councils the need to put strict conservation measures into place 4 or 5 years ago? I was wondering , while looking at Bruce and his wedding ring, if his wife is glad he's not home tonight. Bruce wants to get into your house and inspect. Would you let Bruce into YOUR house? 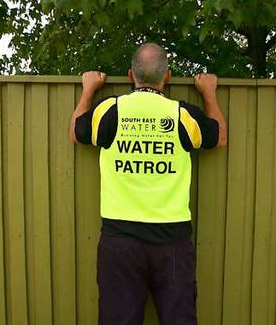 You can hire your own water inspection professional to generate a report for the city. How much would that cost us, Bruce Loose? This seems extraordinarily complex. Bruce is now counting trees and shrubs. Water flow restrictors just makes it take longer to over use. It's time for Inman to go. Fire him now! I live in San Dimas now, and our water bill last month was $88.78. Our water company is privately owned. No fines or threats of them have been made. Nobody wants to get inside my house and inspect it, and nobody wants to count our trees and bushes. Just so you know what Inman is peddling isn't happening everywhere. Hey hey ho ho Flim Flam Inman has got to go! It is the Bruce Inman of cable TV companies. Elaine seems subdued this evening. She also needs to be let go. 1 unit of water = 745 gallons x 12 (maximum usage in Tier 1, lowest fee rate) = 8940 gal per 60 day billing period divided by 60 = 149 gallons/water/per day/household, divide by 4 (family of 4) = 37.25 gallons of water per person. Did I calculate that correctly? LIving life on the skimpy side of water usage gets you no penalities, no Tier 2 water rates and lots of smelly toilets, etc. This is a desperate business. Elaine is talking too much. She knows the council is not happy with her. I feel like I am watching the Cappocia and Elaine dog and pony show. Looking forward to reading The Tattler tomorrow. Gene Goss spanked Elaine. She said she wouldn't do it again. 71 appeals? They didn't get anything but an apology letter.